Hi I just bought a 120k Audi A6 2001 2.7T. I had to stop for some work on the way back to home when I noticed that even after turning off the Engine, the fan in CAR was still running (may be to cool engine off ?). I live in MN and its hot at this time (around 98F). When I returned back to my car after 10 min engine was still cooling itself by FAN. I started the car and drove 'slowly' , as there was some repair work going on in the Parking Lot where I parked my car. After I tried to take a turn on the STOP Sign -- the POWER STEERING capability of the car was gone. I faced this issue for the first time since I have begun driving (about 4 years - I have drove a Camry). I was just able to avoid an accident that might have happened as I was on the main street of the town :( Then I parked my car in another parking lot (barely 40 50 yards away) and called my Insurance to send me a towing vehicle..
As per him, the issue was Engine was overheated.. He showed me by driving the car slowly in parking lot - that it is still in drivable condition, I just need to drive it easily with caution and dont take narrow turns.. He told me - once the car gets cooled off Engine Power Steering will come back and there is no need to visit an Audi or Firestone facility.. Still my CAR is cooling off outside and I am waiting to test it again.. I thought of posting my experience on this community so that I can get an idea of fellow drivers and auto mechanics on if this is a KNOWN ISSUE ? What is the Root Cause of the Problem ? How to get it fixed (if repair is required)? and HOW much its gonna cost me ? First of all you won't lose power steering if the engine is overheating. That is unless there is coolant spraying on the drive belt for the power steering pump causing the belt to slip. There is no way for us to tell you exactly what is wrong or how much it will cost. Have you even checked the coolant level or are you going to keep driving it and burn up the engine if it is indeed overheating? PS: The tow truck driver needs to stick to towing vehicles and leave diagnosing them to the technicians. The tow truck driver is a moron. One thing that I forgot to mention before is the Towing Person who came there - opened the hood of the car, checked the belt and fluid level and told me that it seems just fine.. He only told he has seen multiple cases - where people facing 'similar' issues (of power steering failure) not working have called in him to tow the vehicle and nearly all the times the issue was overheating.. The only thing that worries me is - how can the car get so hot by driving only about 30 miles at 60mph and AC turned ON... If it does, what can be the potential reason.. ? The power steering system isn't going to turn off if the engine is overheating. That is BS. Have you checked the coolant level yourself? Firestick may have missed something during their inspection. You can overheat an engine is less than 5 minutes of driving. You need to have it checked out because if there is something causing it to overheat and you keep driving it, the cost for repair is going to skyrocket. thanks a lot for the information.. After I saw your first reply - I took the car to nearest Firestone (yet again :( ) and dropped it there to be inspected. After the Power Steering and the HEAT problem, I have driven car for like 4-5 miles in nearly 1.5 hour (It was parked outside for last 1 hour when I was waiting for it to cool down).. I will wait till tomorrow morning to hear back from the Firestone guys on what they diagnose and how much its going to cost to repair.. Only question left now is -- What should I do, get it fixed from Firestone (are they credible enough) OR get it fixed from Audi Dealership.. Please recommend.. ! Again -- thanks a lot for your help and guidance.. Depends who is working on it at Firestoners if you will get an accurate diagnosis or not. VW and Audi can be a pain to work on and there are a lot of specialized tools needed when doing work on them. If you can find a place that specializes working on Audi, you would probably be better off. That is my opinion, of course. That's OK, He was driving a tow truck last week. Really ... they are not qualified enough ?? You have one of the most intricate and difficult to understand vehicles on the road. The quality of people at any of the national chain stores doesn't meet what is required to work on that vehicle. The average mechanic working at one of these places is basically a parts changer that is paid commission on everything they can add to your bill. Most have had no training on that vehicle or systems at all. Any technician of the caliber you are looking for would be in high demand and not work at those places. +1 to both. I try to shy away from audi's. Good vehicles, but can throw some curveballs. I went to Firestone and the estimate they have given me to fix the car is mind boggling.. they are asking for about 3200$ to fix the breaks, and car power steering issue which is like way more than what I was expecting.. I asked them, I got an inspection done on the car 2 days ago in another firestone facility and why was none of these issues caught at that time, I got a standard reply - that it was a visual inspection and nothing came up at that very moment..
After that I called the previous owner of the car who 1st day dint answer my calls - I tried to connect with him the 2nd day and when finally he answered I told him everything.. He said = he never knew there was an issue in the CAR.. a standard reply you will expect to get.. I have brought my car back home without getting it fixed from them.. The previous owner of the car spoke with me about half an hour looking at the 'estimates' I got from Firestone and told, he never faced this issue when he had the car for last 7 years. He said - 'I am probably being ripped off by the Firestone' and asked me to get the car to Audi Dealership to get it reviewed.. now as it is long weekend (Labor Day).. I will get the car inspected on Tuesday.. Not sure how much it is going to cost me to get it fixed .. 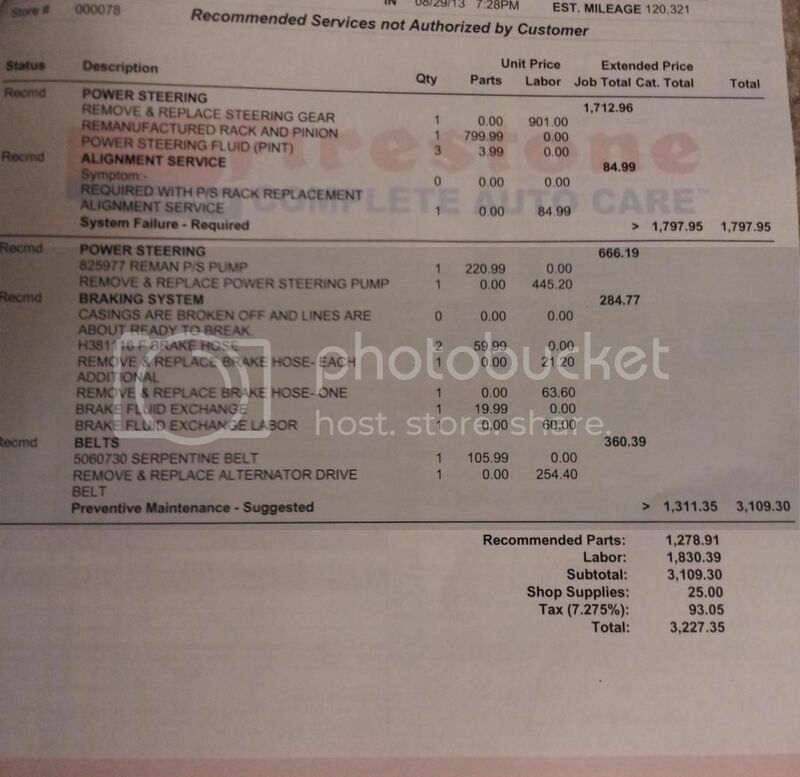 I am not sure which of the two to sue = Previous Owner (as car gave me problems after I drove it less than 50 miles after I bought from him OR the firestone as they inspected vehicle and found no issues, after less than 36 hours handed me an estimate of 3200$ ? and is it possible at all ? LOL ! Why don't you scan the estimate and upload it to an image hosting site like Photobucket and they will give you a link to make it show up here. I wouldn't trust Firestone as far as i can throw the building. You need to get away from these National chain stores. This is where you regret buying an Audi. Their estimate is for a rack and pinion, PS pump, a couple brake hoses and a belt, which on most ay other car would be about $1500 but you drive 4WD Audi and the labor times are outrageous. The rack alone is over 10 hours, hell the belt is 2.5 hours. They are usually half an hour on most cars. I don't know that those people are skilled enough to do this but the price is in line. Yep, German engineering cost money to fix here in the states. What is wrong with the steering gear? Leaking? In the preventive maintenance area there is overlap in there with the belt and power steering pump, but they are charging you for each one individually. You have to take the bumper and belt off to get the pump out, so the labor they are charging for the belt shouldn't be there. I guess the last firestone tech didn't see the brake hose issue....whatever casing getting ready to break off means. You could always get a second opinion or shop around for lower prices. Just don't let Goober, the wanna be mechanic, work on it in his shed in the back yard for peanuts. Stay with a licensed, insured, and reputable repair shop. If I was looking at anywhere near that amount, I would definitely take it to the nearest Audi dealer.